Meave wears a gown by Hazel Comyn and floral crown and bouquet by Maura's Cottage Flowers. Photo : Barry Murphy. Styling : Orla Diffily. This look would be perfect for a contemporary bride who wants something a little different with more traditional elements such as Irish lace, and also for foreign weddings. Photo Credit: Barry Murphy. 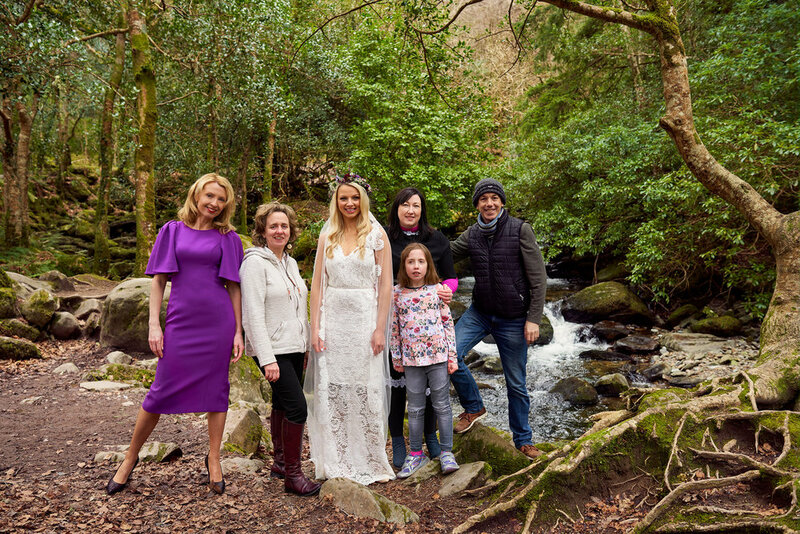 To launch the fashion shows, we styled and produced a photo shoot on Monday 19th of March in the BALTIC but so beautiful surroundings of Torc Waterfall, just outside Killarney, Co. Kerry. Feeling no cold despite the sub zero temperatures, model Meave Carey was the hero of the day and attracted a lot of attention from curious tourists visiting the Torc as she balanced majestically in heels on a rock beside the falls! 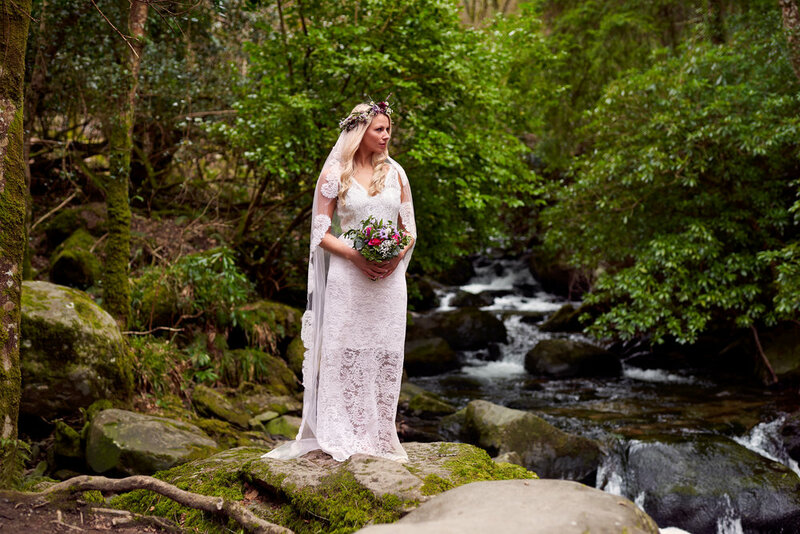 Meave wore the most exquisite lace gown hand made by multi award winning designer Hazel Comyn with a foraged floral crown and bouquet created by Maura Sheehy of Maura’s Cottage Flowers. Thank you both sincerely for coming along and adding such creativity and fun to the day. Both of these creatives will be showing at the Kerry Wedding Show - so don't miss the opportunity to see their work and meet them in person. The fashion shows will open and close the Kerry Wedding Show and will feature the latest Irish and international style from top bridal designers, boutiques and milliners and also include new season looks for the bridal party, Groom, Mother of the Bride & Groom and occasion wear for guests of all ages and body shapes and sizes. It will also be a wonderful opportunity to view collections from top Irish designers, milliners and award winning boutiques all in the one place on the one day - giving everyone inspiration and style tips for their own big day ! As always please DM me if you need any more information. I would love to hear from you. PS Thank you to the five star Muckross Park Hotel for giving us somewhere wonderful and warm to change !